After having their heyday in the 1980s and 1990s, minivans fell by the wayside in favor of giant SUVs. Now, the minivan is back and it is better than ever. One of the best choices available is the 2018 Kia Sedona. Named for the desert town located in Central Arizona, the 2018 Kia Sedona is the ultimate mode of transportation for daily commuting and road tripping. Unlike the minivans of yesteryear, the 2018 Kia Sedona is incredibly stylish (with no faux wood paneling!). Its sleek exterior offers plenty of space for custom logos or family stickers. Smooth-sliding side doors and a wide-opening liftgate also allow for easy loading/unloading of your cargo – no matter if it is your business product or your kids' school projects. Minivans are renowned for being affordable vehicles for families or businesses on a budget. The 2018 edition of the Kia Sedona is no exception thanks to its starting MSRP of $26,900. Even with the affordable price tag, you get plenty of awesome features! The 2018 Kia Sedona comes available in five different trims so that families and entrepreneurs can enjoy the perfect number of features without going overboard. Trim options for the 2018 Kia Sedona include the L (base), LX, EX, SX, and SX Limited. The 2018 Kia Sedona model's sleek exterior is enhanced with the help of eight color options. Hue choices include Clear White, Silky Silver, Aurora Black, Platinum Graphite, Venetian Red, Celestial Blue, Titanium Bronze, and Snow White Pearl. 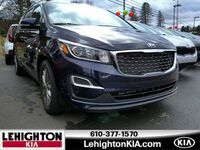 The 2018 Kia Sedona is now available here at Lehighton Kia, so come visit our dealership today to check it out!